A set I created in 2013 which emulates the Topps Inception Look. I will create a number of customs in this set, but the primary set will be a tribute set to the USFL. One of the original dual threat Quarterbacks, Mr. Lewis often doesn't get the credit he deserves for his pioneering of the position. He returned 3/4 customs (K1AO) in 37 days. This return leaves one team remaining. I have the card made, just have to send when I get confirmation that the athlete is signing again. Really struggled to find a good quality pic of a Bulls alumni that signed consistently. After some digging, I finally found a good pic of former Bulls QB Matt Ferguson. He returned 3/4 customs (K1AO) in 18 days. This leaves me with two teams to go... I have one out, and one to send. Getting excited! Awesome return! Didn't have an address for him and I took a shot off some research. 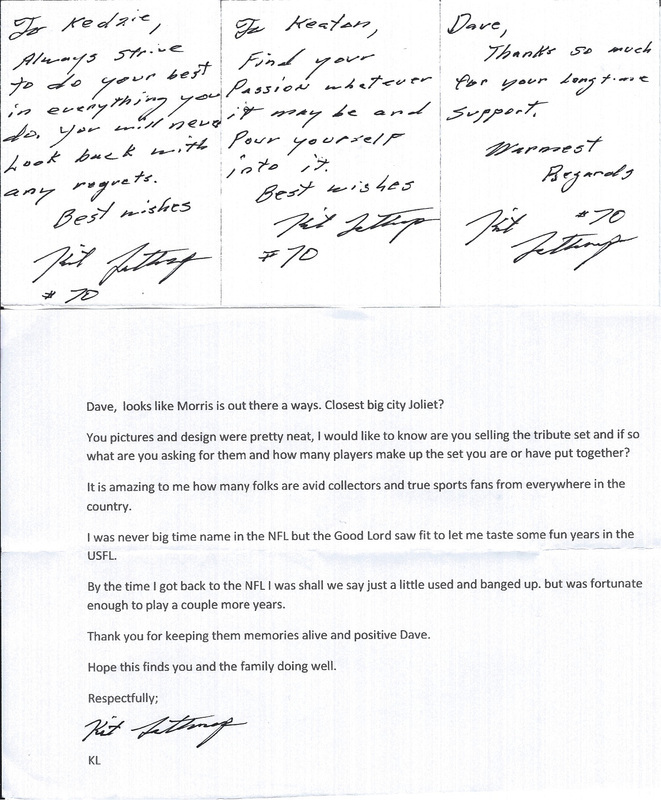 He sent a great note and personalized 3 cards to my kids and me. But, he signed them all on the back. I will send one more and request a signature on the front. 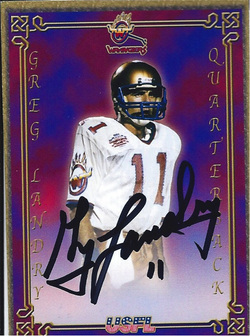 Love the return... just want a signature on the front of the card to match the set. I sent a second request to Mr. Lathrop and he came through with a signature on the front! Awesome. 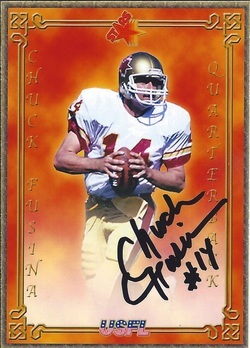 Lightning fast return by the USFL all time record holder in passing attempts & completions. 5 days door to door. Returned 3/4 customs (K1AO). Finally... the other big one from this set came home. Mr. Young returned 2/2 via his foundation in just over six months. One of my big ones I've been waiting for. Mr. Walker finally sent back 2/4 custsoms (offered 1) in 157 days c/o his home. Took awhile, but Mr. Buggs returned 3/4 customs in 136 days via his home. K1AO, postmarked from Atlanta. This one was out for awhile, but came home with a nice note. Returned 1/2 (K1AO) in 102 days. 45 days door to door, but Mr. Carter came through. Returned 1/2 customs (K1AO). 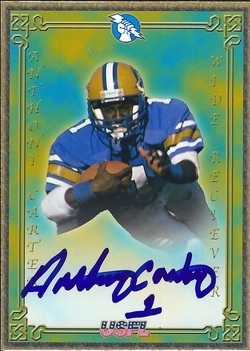 Always liked the way he played in the USFL & NFL. Although I really wanted him for my Blitz card, I had to settle for him in a Wranglers uniform. Returned 1/2 customs (K1AO) in 67 days via his home. It was IMPOSSIBLE to find any good color shots of the Washington Federals... especially anybody worth trying to pick up. I ended up using an image off an 1984 USFL Card to put this together. Not my favorite picture, but one of the signatures I most wanted back. Coach Hohensee has had a great career in the Arena League since his playing days and I'm glad this one came home. 8 days door to door, returned 2/2. Sent 3 customs to Mr. White, he returned 2 (K1AO) and included a note thanking me for the cards. 8 day turnaround. Took a shot on this one. 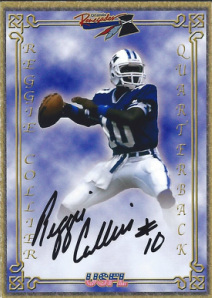 Mr. Collier is not a big signer, but he came through for me. Sent to his work and he returned 1/2 customs (K1AO) in 11 days. Awesome return! Mr. Evans returned 1/2 customs (K1AO) in 11 days via his home. Beautiful sig! 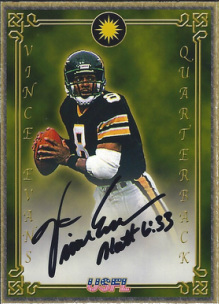 The former Heisman Trophy Winner signed 1/2 customs (K1AO) and also sent back a signed index card. Always a reliable signer. 13 days door to door. Three out of the first five are home. Mr Hebert returned 1/2 customs (K1AO) in 11 days via his home. 10 days door to door. The former Stallion returned both customs. 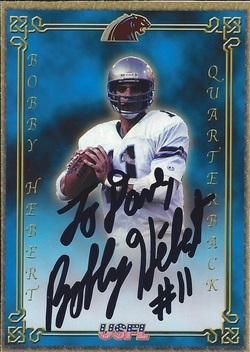 My first return from the USFL set that I have created, and it's a great one. Mr. Fusina returned 1/2 customs (K1AO) in 6 days via his home.